The Merkel III Cabinet should have lasted from 2013 to 2017, but it lingered on in office for five months – from the first meeting of the new Bundestag on 24 October 2017 until the appointment of the new cabinet on 14 March 2018 – as a caretaker government. In the midst of that unprecedented political crisis, I quipped earlier this year that “Germany Is the New Belgium” after it became clear that Merkel wanted to avoid another election at all costs. 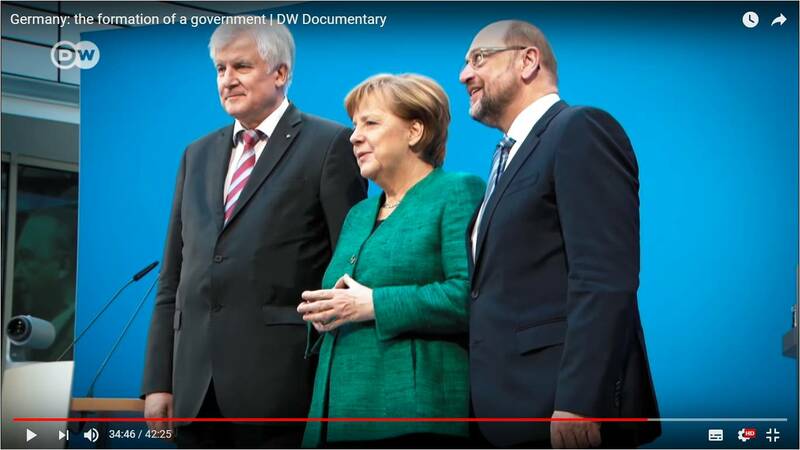 I’m following up on those two earlier entries, belatedly, and showing how Merkel III ended and Merkel IV finally took office on 14 March 2018. This DW documentary recounts in some detail all the travails that went into the negotiations during those six months. In sum, Martin Schultz of the SDP had initially refused to enter into another Grand Coalition, and the CDU-CSU initially sought the “Jamaica Coalition” (so-called because of the official colours of the three parties involved) between them, the Greens, and the Free Democrats. The Free Democrats withdrew from those talks and caused them to collapse in late 2017. The Merkel III Caretaker, which already consisted of the Grand Coalition, then had to make another overture to the SPD. The CDU-CSU and the SPD then finally agreed on a new Grand Coalition in March 2018 after much bitter wrangling of factions within the SPD itself. When Merkel and Schultz emerged at a press conference to announce that they had reached an agreement on the third Grand Coalition since 2005, they both tried to make the best of it. Finally, on 14 March 2018, in accordance with Germany’s Basic Law and its own standing orders, the Bundestag finally held the confirmation vote that made Angela Merkel Chancellor for her fourth term, and the ministers of her third Grand Coalition of CDU-CSU and SDP took their oaths of office. (My browser translated the webpage from German to English). In Canada, the term of a Ministry begins upon the appointment of the Prime Minister heading it and ends with the resignation or death of the same. For example, Stephen Harper served one term as Prime Minister of Canada from 6 February 2006 to 3 November 2015, even though his premiership spanned across three separate parliaments (the 39th, 40th, and 41st). As another example, Pierre Trudeau served two terms as Prime Minister because they were non-consecutive: the first from 20 April 1968 to 3 June 1979; the second, from 3 March 1980 to 29 June 1984. If Harper re-entered politics, led the Conservative Party to victory, and were appointed as Prime Minister again, only then could we speak of Harper’s “second term.” Thus far, only Mackenzie King has served three terms as Prime Minister of the Dominion of Canada alone. (Sir John A. Macdonald served more than three terms as Prime Minister of the Province of Canada and the Dominion of Canada combined). Germany does things a bit differently. Article 69 of Germany’s Basic Law says that the tenure of a German Ministry is tied to both the tenure of the Chancellor and to the life of a Bundestag, usually four years. This is why even though Angela Merkel has been Chancellor since November 2005, she is now on her fourth term as Chancellor and head of her fourth Ministry as Chancellor. If a Chancellor resigned or died mid-parliament, or if the Bundestag passed a motion of constructive non-confidence and nominated a new Chancellor mid-parliament, then the Ministry would also end. The Germany system works in this manner because Article 39(2) of the Basic Law provides both that the new Bundestag must meet within one month after the general election, and because Article 63 of the Basic Law provides that the German President appoints the German Chancellor in accordance with a confirmation vote of the Bundestag. All of these provisions necessarily tie into one another. If we had to codify our system from scratch after a war and occupation by our victorious enemies, then I suppose that we would have come up with something similar in Canada. But I am thankful that we can rely on a wealth of history and precedent, instead of rote, codified constitutional law, to guide the transition of power between governments. This great privilege signifies liberal-democratic maturity and a healthy political culture anchored in ordered liberty and the rule of law. The Merkel III Cabinet served as the operative Ministry from 17 December 2013 to 24 October 2017, and then as a caretaker Ministry from 24 October 2017 (when the new Bundestag elected in September 2017 first met) to 14 March 2018. This press release from the Office of Federal Chancellor (which is either available in English or which my browser has translated automatically into English) from 24 October 2017 says that “Federal President Frank-Walter Steinmeier presented the Chancellor and the Cabinet ministers of the outgoing coalition with their certificates of discharge.” However, President Steinmeier also asked on that day that the Merkel III Ministry stay on as a caretaker government in accordance with Article 69(3) of the Basic Law. The Cabinet ministers too are obliged to remain as acting ministers if so requested by the Chancellor or the Federal President. In this way the former government with its ministers can remain in place from now until the election of the new Chancellor. An acting government has the same authority as a “regular” government in office. It has, however, been standard practice to date that during this period no far-reaching decisions are made that would bind the following government. This covers far-reaching financial and personnel-related decisions, but also the adoption of legislation. In any case the German government remains fully able to act until a new government is formed. This is substantially the same as how the Manual of Official Procedure of the Government of Canada and the Privy Council Office’s Guidelines on the Conduct of Ministers and Exempt Staff During An Election describe the caretaker convention here in Canada: the caretaker government, legally, has full authority but, constitutionally, it limits itself to making routine and necessary decisions and refrains from doing anything irreversible or controversial. This third Grand Coalition mostly continues what already existed from 2013 but also makes worse the trend of abandoning the opposition to extremists, which now consists primarily of parties widely regarded as representing the far-right and the far-left. It is therefore unlikely that the continued power-sharing between what are ostensibly the two mainline parties competing against each other for forming government will halt the rise of extreme parties filling the void and the function of opposition. Germany shows why Grand Coalitions should be reserved only for true emergencies and exceptional contingencies where the national interest must prevail temporarily over the normal operation of parliamentary systems of government and the government-opposition dynamic, like taking the steps necessary to turn the Province of Canada into the Dominion of Canada between 1864 and 1866 and the First World War (where Canada, the UK, and Australia also had coalition governments for at least part of the conflict). If everything is an emergency, the nothing is an emergency. If Grand Coalitions become the norm, as they have in Germany since 2005, they distort a country’s political system and might even force a political realignment. This entry was posted in Comparative, Formation of Governments, Government Formation in Germany. Bookmark the permalink.